NEW YORK (CNNMoney.com) -- Chrysler will be the only U.S. automaker to advertise in this year's Super Bowl, forking over millions of dollars to restore its image following its bankruptcy and the federal bailout that followed. "What better way to illustrate to our customers that we are still here than to air on the Super Bowl, which is not only watched for the game, but also for the advertising spots," said Chrysler spokeswoman Dianna C. Gutierrez. Should the federal government impose special fees on banks in order to recoup some of the bailout funds? She said that Chrysler will advertise its Dodge Charger in a 60-second commercial that will showcase "the passion of Dodge." A 60-second spot is the longest and the most expensive ad available during the Super Bowl. The 30-second spots are more common, and are selling for about $3 million each according to Dana McClintock a spokesman for CBS, which is airing this year's Super Bowl. 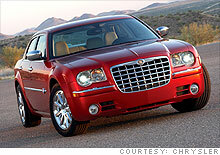 It isn't clear exactly how much Chrysler is paying, but CBS said on Thursday that it was close to selling out. Chrysler has been struggling for some time. The automaker was rescued by a $7 billion bailout from the U.S. government, and then sold a minority stake to Italian automaker Fiat. "My guess is that Chrysler wants to take the opportunity to talk to the American people and say, 'We're here, we're a long term player, and we have a good product,'" said Jim Cain, marketing executive with the Quell Group, a brand communications firm based in Troy, Mich.
Viewers won't hear anything from the rest of the Big Three during the big game either; both Ford Motor (F, Fortune 500) and General Motors have said they're skipping it this year. GM, which received a $50 billion government bailout, won't advertise during the game because the company doesn't have any new cars launching, according to spokeswoman Ryndee Carney. "We don't have anything new to talk about," she said, noting that GM did not advertise in the 2009 game, either. Quell's Jim Cain speculated that Ford and GM bowed out of the year's biggest Bowl game because the ads are so expensive. "It's a lot of resources to put towards one 30 or 60 second spot on one night when you have to advertise for the rest of the year," he said. "The Super Bowl is a very crowded game," he said. "It's a very competitive advertisement arena and you're one fish in a very large ocean." Still, Chrysler is probably hoping to tap into the massive audience that goes along with all of that. Last year's ratings were a record high, with 98.7 million people tuning in to watch the Pittsburgh Steelers beat the Arizona Cardinals. CBS identified several foreign automakers that will also be advertising in the 2010 Super Bowl, including Honda, Hyundai, Kia, Audi and Volkswagen. The 43rd Super Bowl will be played Feb. 7 at Dolphin Stadium in Miami Gardens, Fla.